The too-bluntly-named Abel Morales (Oscar Isaac) is a relatively good man in a very, very bad business. As one of many purveyors of energy in early 1980s New York City, Morales refuses to play by the dirty rules that define the game, instead convincing his men that they can win by being better than the competition consistently. Unfortunately, someone sees this as a sign of weakness, because his trucks full of gasoline are being hijacked on the roads, his drivers beaten mercilessly. A local ADA (David Oyelowo), convinced he can't be as straight as he claims, starts to really dig into his business practices, while Morales' wife (Jessica Chastain), a gangster's daughter, is constantly angling to force him to make a stand. Even as Morales puts the majority of his fortune as a deposit on land that will make or break his growing business, one particularly brutal attack on one of his drivers will force him down a path of moral compromise that could shatter everything he has tried to build. 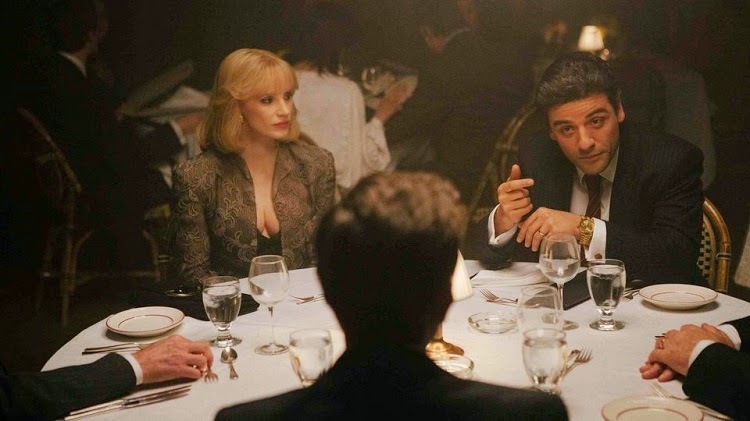 J.C. Chandor's films can be blunt, often to a fault, and A Most Violent Year is no exception. They also tend to be impeccably crafted - and A Most Violent Year is, again, no exception. Abel Morales is a man desperately trying to be the man he tells people he is, and Chandor's film is dedicated to testing that worldview throughout. As such, the film is weighty and ponderous, a considerable amount of emphasis placed on restraint. What is the advantage of restraint, of turning the other cheek, when people are coming at you with guns? Can you possibly do business like that? And just how much of his ideals come from reluctance rather than morality? Oscar Isaac (Inside Llewyn Davis) is phenomenal as Abel Morales, channeling Al Pacino's Michael Corleone as a controlled, meditative man who could seemingly erupt in a rage at any moment. It's almost the polar opposite of his flighty performance for the Coens, and he manages to walk a careful edge between morality and fear that makes it difficult to tell what his precise motives are. David Oyelowo (Selma) is a solid sort-of antagonist as a local district attorney who wants to clean up the energy racket, while Albert Brooks (Drive) plays it straight and understated as Abel's attorney. And Jessica Chastain is in fine form as Abel's bold, brashy wife, a gangster's daughter who is never quite comfortable playing things straight but has the cunning to play the game on her husband's level. Chastain is underwritten (as all Chandor's female characters tend to be, sadly), but she has wonderful chemistry with Isaac. The two are one of the most believable married couples I saw on the big screen for years, comfortable and trusting if no longer passionate. It's hard to make a thriller about restraint - about resisting action. The tension needs to be surging and powerful, and Chandor, whose previous two films were masterpieces of refusing to deal with problems until it was too late, is a bit too slack here. But A Most Violent Year is powerful nevertheless, a quiet, memorably mature drama. Chandor's movies are slow and utterly humorless in a way that will almost certainly turn many viewers off - as this one has been doing - and A Most Violent Year lacks the cruel momentum of Margin Call and All Is Lost, but for those of you who don't mind a more measured thriller, this one hits hard. A Most Violent Year was Nightcrawler's statelier (read: considerably less fun) cousin, another lost New Hollywood look at what it takes to get ahead in America's business world. It lacks the satirical punch of Gilroy's masterpiece, but maintains its bitter edge. A Most Violent Year is available now in theaters across the nation, including Atlanta's Midtown Art Cinema. Written and directed by J.C. Chandor, A Most Violent Year stars Oscar Isaac, Jessica Chastain, and David Oyelowo.